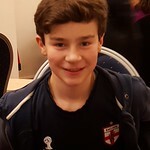 I started playing bridge aged 10, and first represented England in a junior international aged 13 in the Czech Republic in November 2015. I live in London and play most of my bridge at various local clubs, including the Young Chelsea and Acol. Away from the table I enjoy playing cricket, rugby, football, skiing, running – and in fact pretty much any sport on offer.